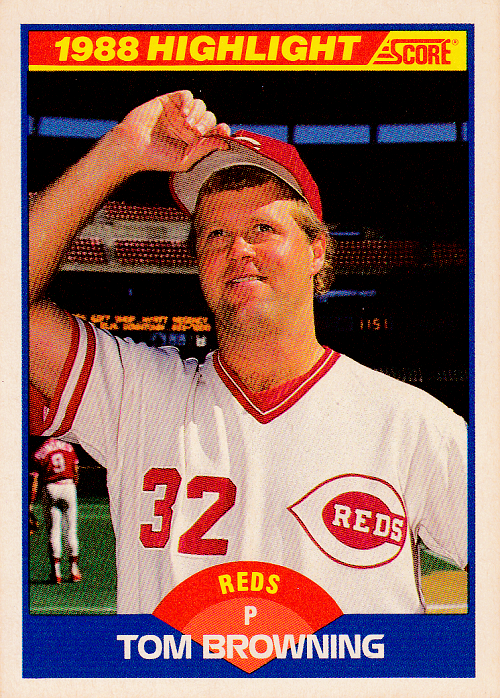 There is Tom Browning, tipping his cap to the crowd, celebrating the first perfect game in Cincinnati Reds history. I’m guessing this was a staged shot, since you can see Luis Quinones warming up n the background. 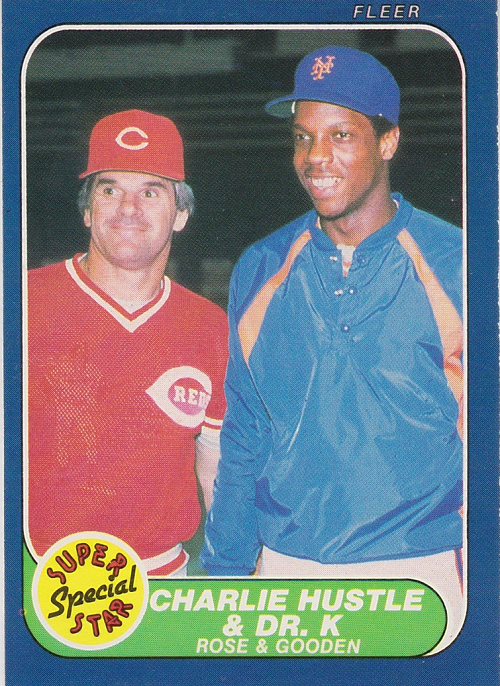 But it’s still a nice card, and you can see a bit of Riverfront Stadium behind Mr. Perfect. 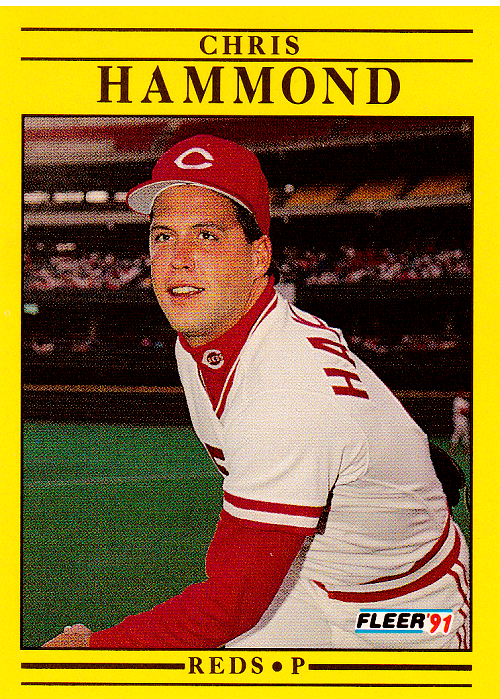 Chris Hammond never amounted to much with the Reds, but you can clearly see a couple of the different colored seats behind him. The lowest level, barely visible here because there were few in the outfield, were blue seats. Then there were green seats, which are nearly filled behind Hammond. Above are yellow, and then the cheapo seats, the red seats. The least expensive seats in the park were the “Top 6” rows of the red section. I remember only cost $3.50 per ticket, but even the more expensive seats were reasonable. I don’t think they had $2500 seats back in those pure times. 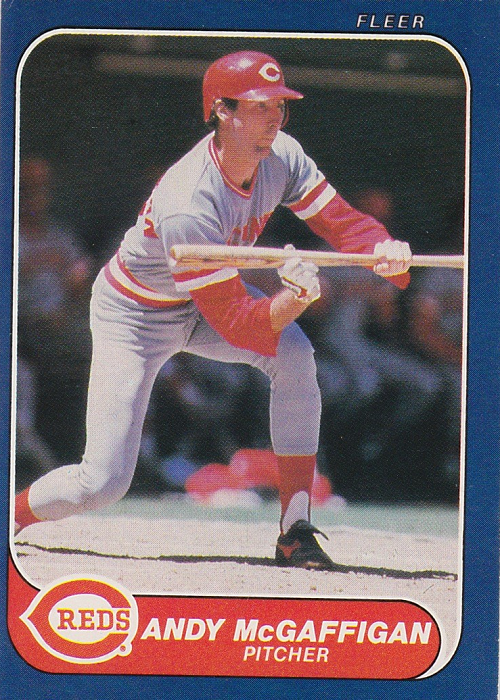 I miss Riverfront Stadium so much I mistakenly, absent-mindedly call the Reds’ current home Riverfront sometimes. I know it’s Great American Ballpark. But I prefer Riverfront. And I always will. 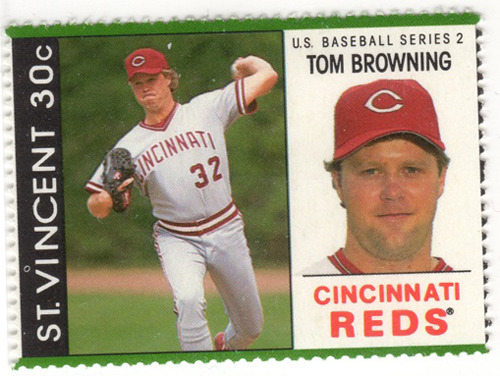 Happy Reds birthday, Tom Browning! Mr. Perfect. The last rookie pitcher to win twenty games in a season. All-around fun guy…just ask the Cubs fans on the rooftops in Chicago. 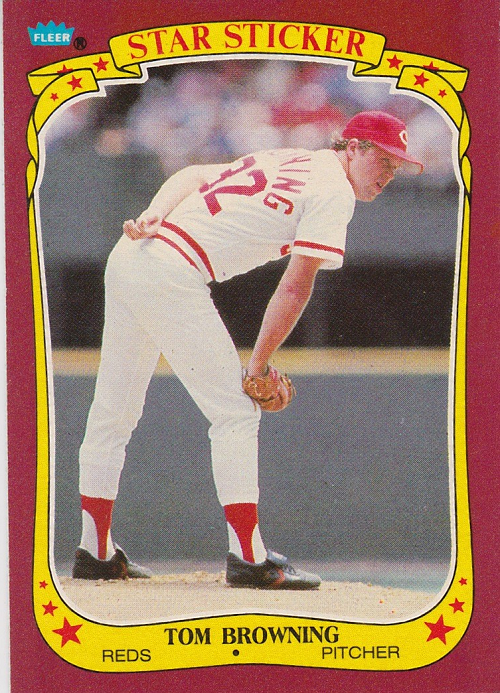 Tom Browning had fun in his baseball career, and when it’s all said and done, that’s what really matters in the end. He was inducted into the Reds Hall of Fame in 2006, and frequently makes appearances at Reds fan events. This Tom Browning stamp was not on my wantlist. 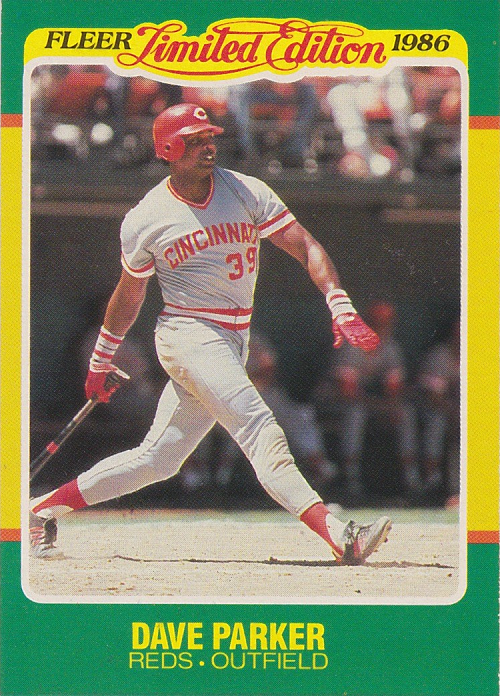 I was somewhat aware of the existence of these St. Vincent stamps thanks to the Tim Wallach blogger, but I’ve never attempted to make any kind of list of which Reds were included in the set. I believe this item came from 2×3 Heroes. 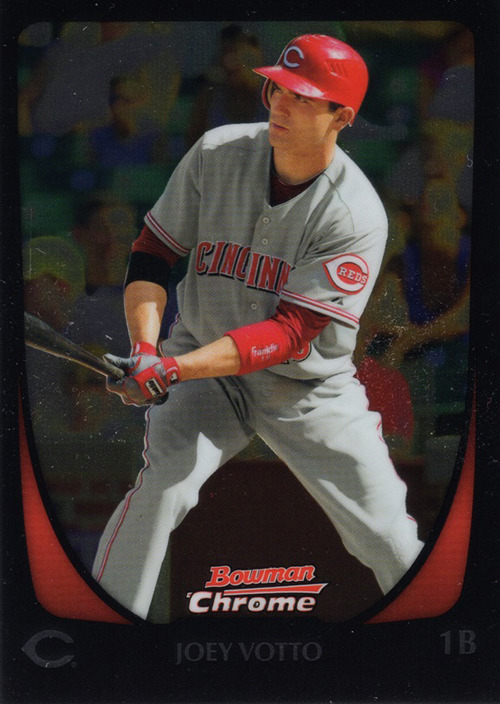 Another package included this Joey Votto Bowman Chrome (does anyone else call it “Chroman” in your head? No? Just me?). If I’m not mistaken, this came from Jim of the late, great GCRL blog. 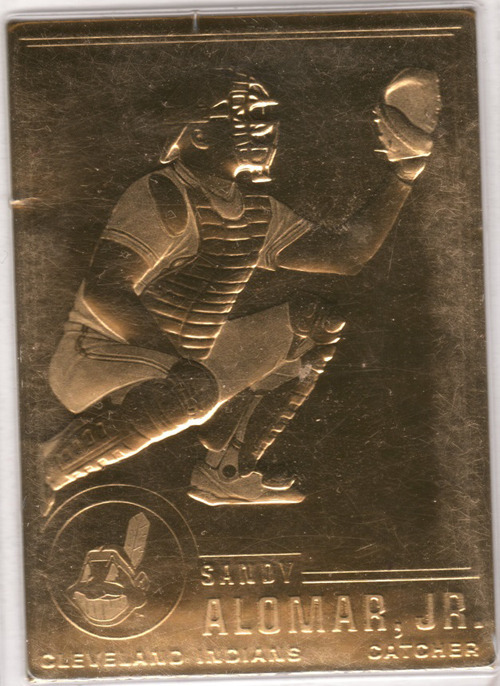 …like this gold Sandy Alomar Jr. card from 2007 that I had never seen before. There are apparently different versions and different years of this Danbury mint issue, including one showing Alomar as a member of the Colorado Rockies. I had no idea Alomar ever played for the Rockies until writing this post. Thank you Jeff, Jim, and David for the cards! My oldest son and I braved the winter storm to attend Redsfest Friday night, and loaded up on autographs! I was able to obtain four players that I did not previously have, and got three more cards signed for my 1984 Topps Reds team set autograph project! 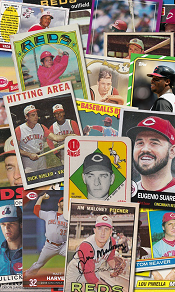 The Cincinnati Reds opened the baseball season on the road only twice in the 20th century (and only four times in the history of the franchise). In 1966, it was the rain that forced the Reds to start in Philadelphia; in 1990, a labor dispute between the owners and players delayed the season and the Reds played their first game in Houston’s Astrodome. Mr. 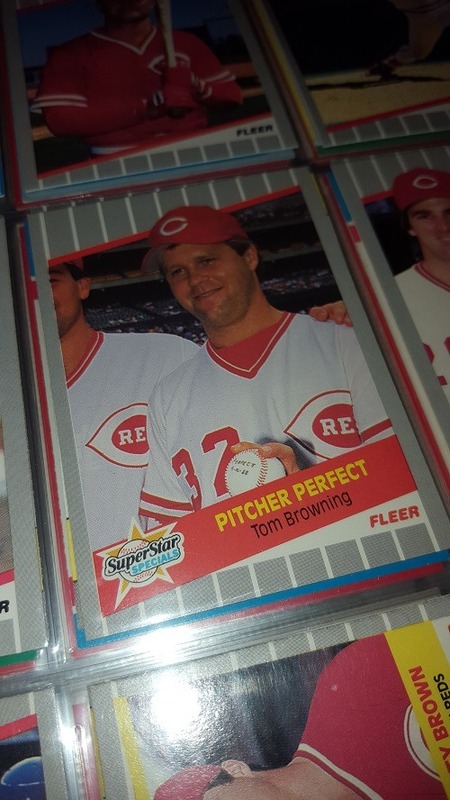 Perfect, Tom Browning, was the Opening Day starter that year, and though he didn’t get the decision, Cincinnati won 8-4 over the Astros. 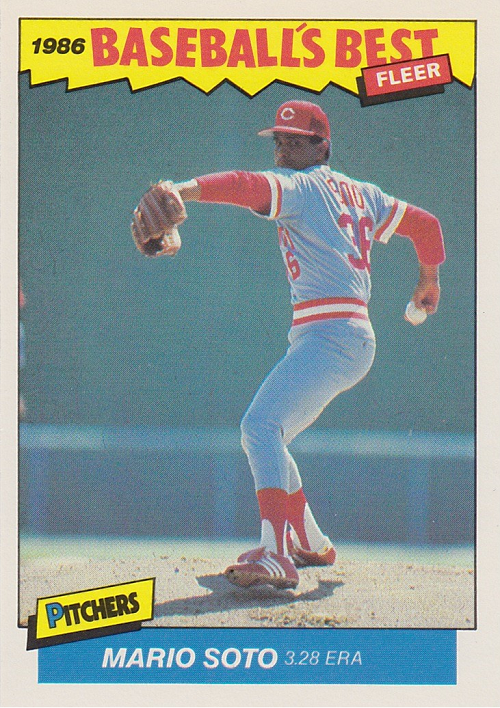 Browning started the season for the Reds three times in his career, going 1-0 (but the Reds did win all three games). The doors opened a few minutes before 11 a.m., and the first autograph session was scheduled to begin at noon. We chose “Mr. Perfect” as our first target of the day. This was not Derek’s first time meeting a player…he’s had the chance to get autographs from Chris Sabo, Jay Bruce, Ryan Hanigan, and his favorite, Joey Votto, in the past. Both boys put their cards up on the table and said thank you after receiving Browning’s signature. I don’t know if the players actually pay attention whether fans say thank you or not, but I believe it’s important for my boys to be polite. We’re not selling these items; they are for our personal collection and enjoyment. 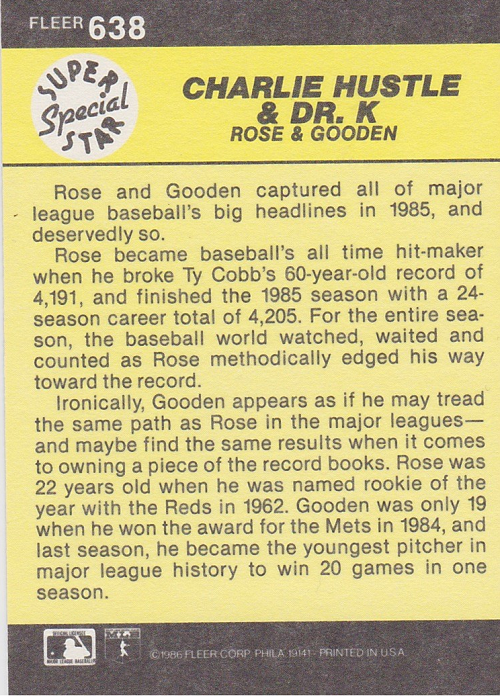 As for me, I chose his 1985 Donruss card. I’m trying to get as many of the 1985 Donruss set autographed as I can, but it is a long process. So far I have Browning, Nick Esasky, Brad Gulden, Jeff Russell, Skeeter Barnes, and Frank Pastore. Coming tomorrow, the only current Reds player we approached on Saturday. I picked Joshua up from school a few minutes after 3:00 and headed straight for downtown Cincinnati to attend the 2010 Redsfest at the Duke Energy Convention Center. By the time we parked and walked across the Skywalk, it was about 3:40, and though it wasn’t scheduled to start until 4 pm, they had already opened the gates and fans were filing in. We checked the autograph schedule and decided to hit the Hall of Fame display first, as “Mr. Perfect” Tom Browning was the featured guest. We got extremely fortunate, as we were only about 5 or 6 people deep in the line. This was the closest to the front that we got all night, but were never denied an autograph once we chose a line. The event is well-organized and the staffers try to limit the lines to how many people can reasonably expect to get through. I didn’t attend a game, but a friend did and gave me the stub afterwards. Like most people, he didn’t stay for the entire game because of the rain delay. I’ve kept the stub ever since, and this year decided to take it with me for the autograph. I will post photos and scans of autographs later because I really want to go to bed right now…but I had a great time! Signatures were secured from Tom Browning, Todd Frazier, Eric Davis, Ron Oester, Ted Power, Chuck Harmon and Bronson Arroyo! GREAT NIGHT! Mr. Perfect, Tom Browning. Sure, he’s had his problems. But during his career, he was a guy who genuinely seemed to love playing the game.